Dictators Handbook Forum Web Interface - [Haiti] awakening to change? Subject: [Haiti] awakening to change? 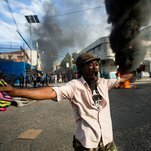 Title: Is Haiti Awakening to Change?